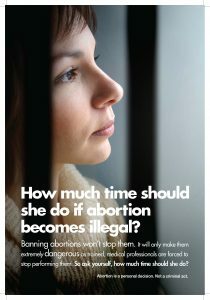 Anticipating that the presidential election of 2008 would put the abortion issue in high relief, the National Institute developed a communications campaign that emphasized the consequences of abortion restrictions that would make the procedure illegal. A multi-year, comprehensive research effort in several states led to development of the How Much Time campaign, which posited that candidates’ positions that they wanted to outlaw abortion would mean treating women and health care providers like criminals. We worked with organizations in Colorado, Missouri, Ohio, Oregon, South Dakota, and Wisconsin to use the How Much Time message to put our opponents on the defensive and motivated supporters on the sidelines to take action. To request more information about the How Much Time campaign, email Tara Sweeney.